Author’s Note: This one has sports in it! Here’s “Miracle” and a little real life hockey for you. Starting to run out of old posts to piggyback on. This means eventually I’m going to have to churn out some fresh, moist content. When? ….hey, look over there! This New Year’s Eve, I decided to switch things up a bit. Instead of plotting my next hangover, I had the pleasure of heading up to Citizens Bank Park in Philadelphia, PA. Also known as “The home of $9 chicken tenders and $5 hot dogs”, Citizens Bank Park is normally home to Philly’s MLB team, the Philadelphia Phillies. On this day, however, the stadium had been converted into an outdoor hockey rink for the purpose of the 2012 Winter Classic festivities. For those unaware, the Winter Classic is a professional ice hockey game that is played outdoors. The Winter Classic originated in 2008 and has drawn quite a crowd since, leading Sports Illustrated’s Dan Shaughnessy to write that the Classic makes hockey on New Year’s Day a new sports tradition, on par with football on Thanksgiving. As I currently have plans for both of my kidneys, I was unable to sell one in order to purchase a ticket for this gala affair. Fortunately for me, there were other events that were a bit more affordable for struggling bloggers like myself. I was lucky enough to catch the Alumni Game between old Philadelphia Flyers and old New York Rangers. And I don’t mean “old” as in last season’s players (before the Flyers made some blockbuster trades that had the hockey community abuzz). No, these rosters were made up of many great players from hockey history. This event had been in the planning stages for a long time, and through the hard work of many individuals (not to mention the love and support of both teams’ fans), the stars came out to shine…in more ways than one. In net for the Flyers (for about 5 minutes, anyway) was the great Bernie Parent. At a spry 66 years of age, Bernie admittedly had not played for 30 years. Yet he is beloved in Philadelphia for helping to bring home The Stanley Cup in consecutive seasons (1973-74 and 1974-75), as well as being a multiple award winner and member of the Hockey Hall of Fame. In addition to Parent, there was also Bobby Clarke (62). Clarke, captain of the infamous “Broad Street Bullies”, played his entire career for Philadelphia, contributed to 2 Stanley Cup victories and currently serves as an executive with the Flyers. Another noteworthy appearance was Eric Lindros, another former captain, who had led the team to the Stanley Cup Finals in 1997, but also suffered countless concussions and a bitter feud with then-GM Clarke before being traded in 2001 and retiring in 2007. And the list goes on: John LeClair. Reggie Leach. Bill Barber. Eric Desjardins. And more. Not to be outdone, the New York Rangers had their own impressive lineup including Mark Messier, Brian Leetch, Glen Anderson, John Vanbiesbrouck, etc. I’d tell you more about them but, being a somewhat recent convert to the sport of hockey, I admittedly don’t know a great deal about the great Rangers of the past. My knowledge of the Rangers is pretty much limited to what I’ve seen of their more recent lineup. Also, they happen to be ahead of the Flyers in the division standings. So “meh” to them. Hillary Knight, because I wanted to. Hey, DT! Convince me! So…why: Miracle? Look, I said this was going to be hockey post and this is a hockey movie, damn it. It was down to Miracle, Slap Shot, or one of the Mighty Ducks movies. So there. Miracle may not fall under the category of blockbuster, but it’s well-made and pretty damn inspiring. 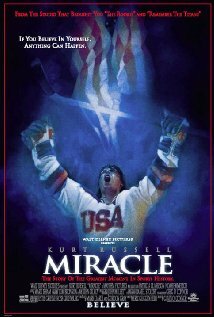 It tells the story of Herb Brooks (played by Kurt Russell), who was chosen to coach the United State’s men’s hockey team in the 1980 Winter Olympics in Lake Placid, NY. Brooks is saddled with the difficult task of unseating the Soviet Union’s team, which was considered the best team in the world at the time. Brooks’ team was made up of college and university players, as even a team of the NHL’s best had been unable to defeat the Soviets. Brooks was determined to whip his crew into a well-conditioned unit capable that relied on chemistry and would be able to withstand the Soviet onslaught and, hopefully, obtain the coveted gold medal for the United States. In what was later branded as “The Miracle on Ice”, Brooks’ squad battled the Soviet Union to a 4-3 victory and, shortly afterward, defeated Finland afterward for the gold. If you’re into hockey at all, sports in general, or even world history, you may already be familiar with this story. “The Miracle on Ice” is widely regarded as one of the greatest sports moments in history. But, whether you’re new to this story or you lived through it, Miracle is a shining example of how people can put aside their differences, overcome adversity, learn to function as a team and, ultimately, achieve success. Kurt Russell’s hair. What up, helmet? As this is a sports movie, you’ll have to satisfy your blood-lust elsewhere, you barbarians! Expect a lot of checks and heavy hits, but look elsewhere for hockey goons and bare-knuckle brawls. Or just turn on a modern NHL game after you’ve finished checking out Miracle. If war is more your speed, there’s a bit of a “Cold War” going on between Brooks and the Soviet Union coach, Viktor Tikhonov. There’s also quite a bit of verbal shenanigans, as Coach Brooks employs a gruff/borderline sadistic/eventually endearing method of dealing with his players and bringing them together as a team. Miracle is probably one of those stories that you love if you’re on the winning side, but hate if your team was the loser. Regarded as a huge upset and an American triumph, it could also be viewed as a colossal failure by the Soviet squad. The story is told entirely from the perspective of Brooks and the US team, with the rival Soviet Union team set up as a sort of unstoppable “boogeyman” that doesn’t make a real appearance until the final acts of the film. Personally, I would have preferred a more balanced approach, or at least a few scenes that allowed you to see and understand the Soviet Team. Still, as far as hockey films go, this is a fun one to watch. In particular, it helps to highlight the difficulties involved in coaching a team (logistically, emotionally, physically) as well as the effect it can have on one’s family. Coaching a team also involves managing the egos and spirits of your players, and that is especially evident here as Brooks goads, cajoles, rewards, punishes and generally makes things unpleasant for his crew. In the end, though, it’s hard to argue with the results. Sadly, Coach Brooks was killed in a car accident in 2003, at the age of 66. Although serving as a consultant for Miracle, he was never able to see the finished product. A special commemorative message at the end of the film reads, “He never saw it. He lived it.” You may not have been able to live Miracle, but you should definitely see it.